Between the controversy of injuries and lawsuits from fans who paid out money for the overpriced pay-per-view fight, we now have another accusation in the mix.An anonymous insider from the Pacquiao camp is coming forward to say the entire fight was staged. The only truth in the entire mess they called the “Fight of the Century” was that Pacquiao truly did have a shoulder injury. Once Mayweather found out about Pacquiao’s injury, he decided to “plan” the entire event. Seats for the event had already been purchased, hotel rooms had been booked, and flights had been paid for. There was no way to back out and disappoint fans with a cancellation. That’s when Mayweather offered Pacquiao an extra $20 million under the table to continue on and ‘go easy on him.’ Mayweather also refused Pacquiao a shoulder injection, but that was also part of the deal. Not to mention the fact that Mayweather’s camp picked the referee and from what I hear lined the pockets of the Nevada Boxing Commission. I mean, what was Pacquiao supposed to do? This insider confession, which was revealed on TV, has fans and in uproar. Is this a set up for the ultimate rematch? 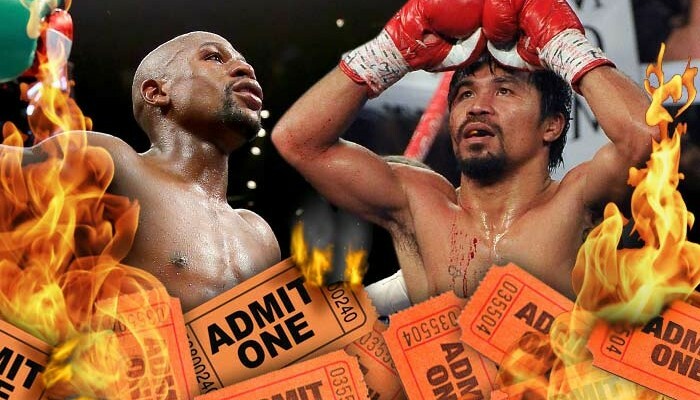 Would fans even purchase tickets or pay-per-view after such an unscrupulous event?